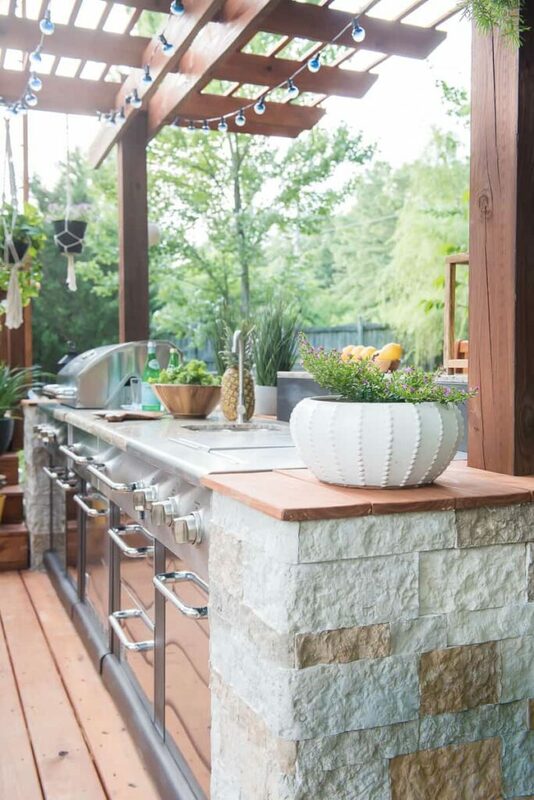 Today is the REVEAL day of our fantastic outdoor kitchen you want to see, my friends! This post is sponsored by Lowe’s, but all thoughts and opinions are my own. I almost can’t believe that this project is finished! 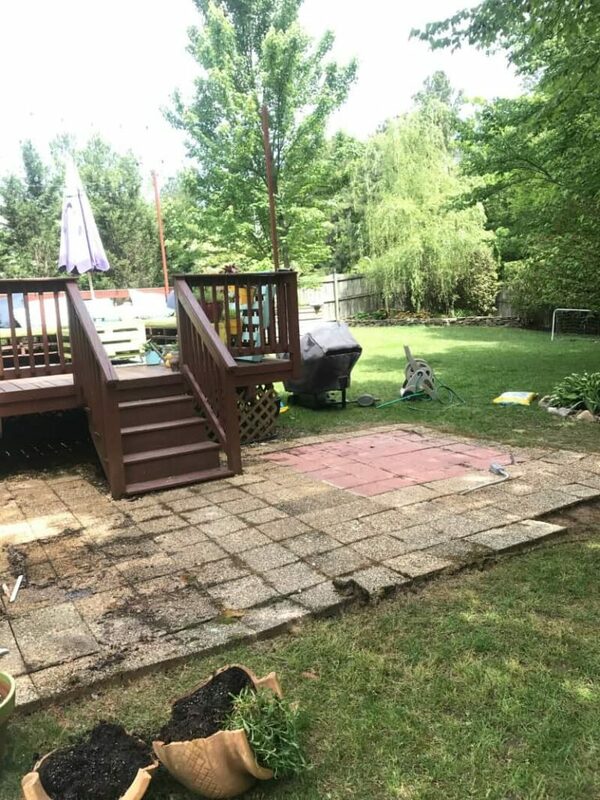 If you are new here let me fill you in the outdoor space story and let’s look back and see where we exactly started about a month and a half ago. As you see, we had a typical 10×10, square deck. 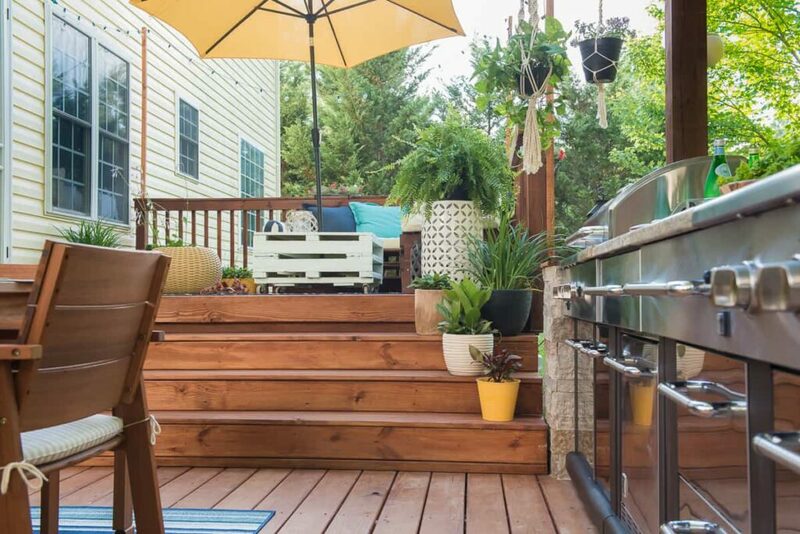 We tried to make our existing deck more cozy and comfy about three summers ago with a DIY pallet furniture which we’ve really been enjoying throughout the summer season ever since. 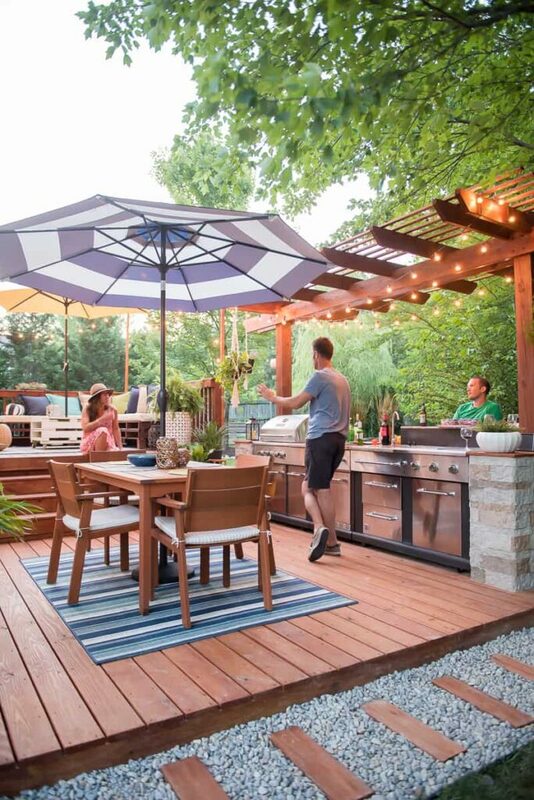 But every time we had a cookout or had friends over we felt like we needed a bigger outdoor space, perhaps a beautiful outdoor kitchen with a seating area. 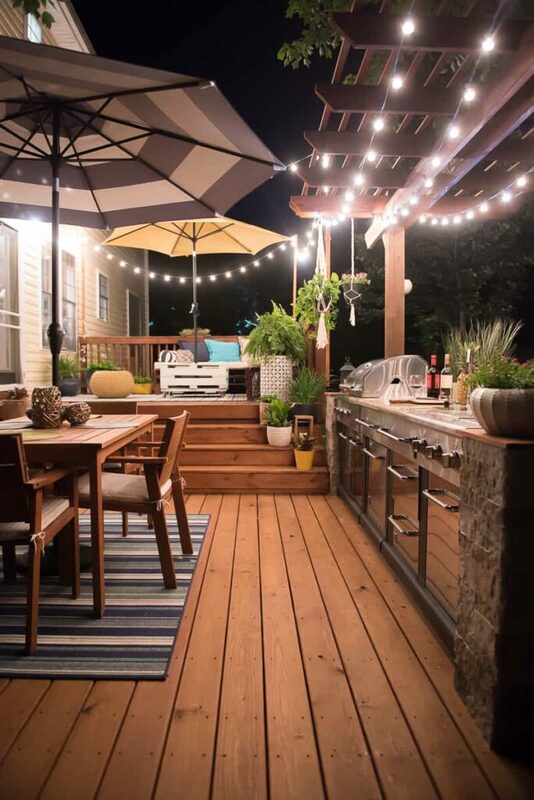 So I dreamed up an outstanding outdoor space in my head with a nice ground level deck that would be an extension to our already existing deck plus an outdoor kitchen with a pergola. Yeah! It was all pictured in my head. I am happy to report that my vision came to life (again:-), and I am still pinching myself that this space that I am about to show you is OUR outdoor space. But before I show you our new area I need to give a huge shout out to my awesome husband who is always a partner in crime and puts up with THIS crazy gal and her even more insane ideas (yup, that’s me!!). I am gifted with many talents but to tell you the truth I wouldn’t be able to accomplish all the work without my man! 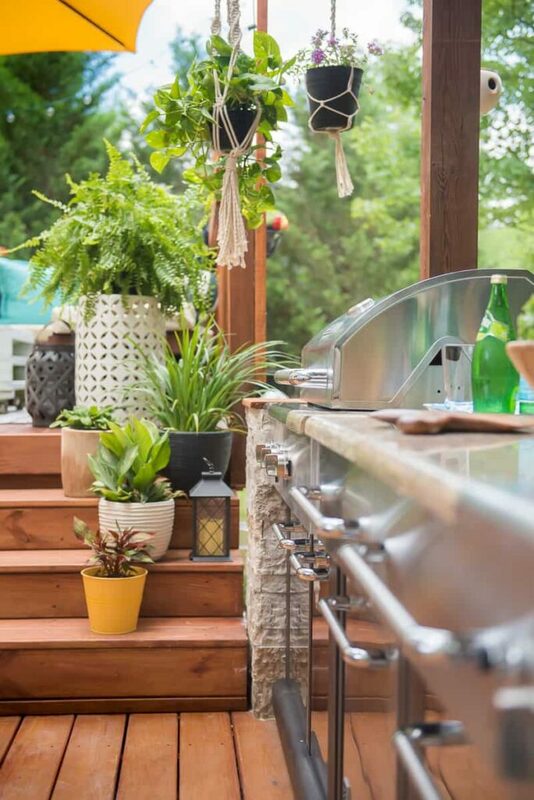 My husband and I worked so HARD to finish this fantastic outdoor kitchen. And I say – it was all worth it! We DIYed all of it! 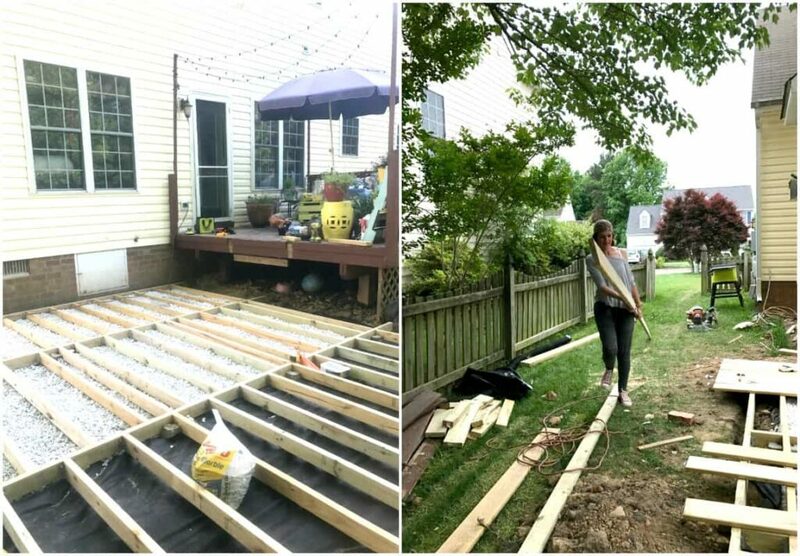 I am hoping to write up some tutorials building the ground level deck and pergola later as I would love to share all that we’ve learned throughout this process! 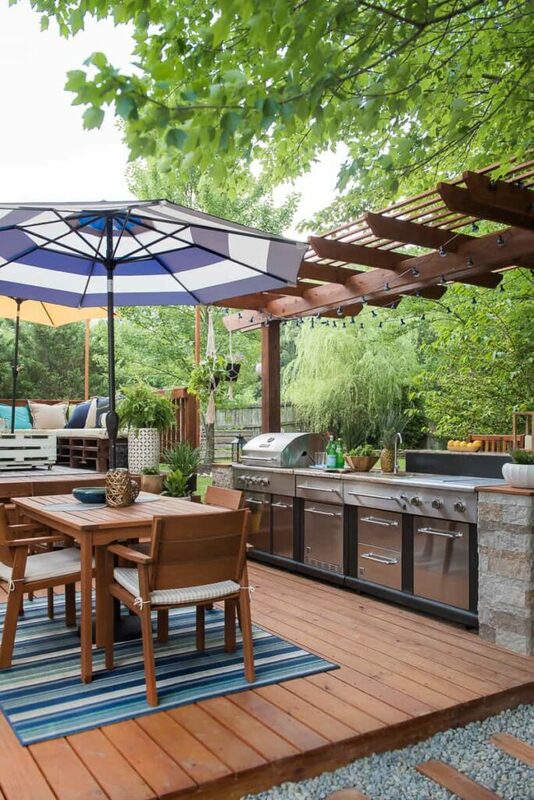 And before we move on, I would also like to say a big thank you for LOWE’S to help us bring my vision to life and providing all materials and products for our outdoor kitchen space! Well, this is where we spent the last month, guys! We got home from our day job, we changed clothes and worked, worked and worked when we had some free time. Awh! I still can’t even BELIEVE that this is our backyard! So let’s dive in and get the deets! I think one of the best decisions we’ve made was to make the stairs wider. It’s a huge plus to this entire area, and it opens up the two decks entirely. 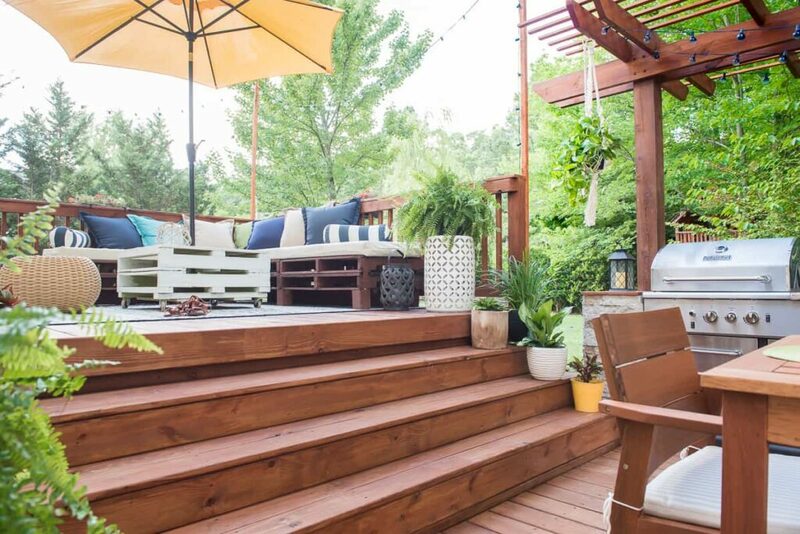 I wanted to ensure that this large outdoor space looks and feels cohesive throughout, so matching the stain for both, the upper as well as the lower level deck was a must. 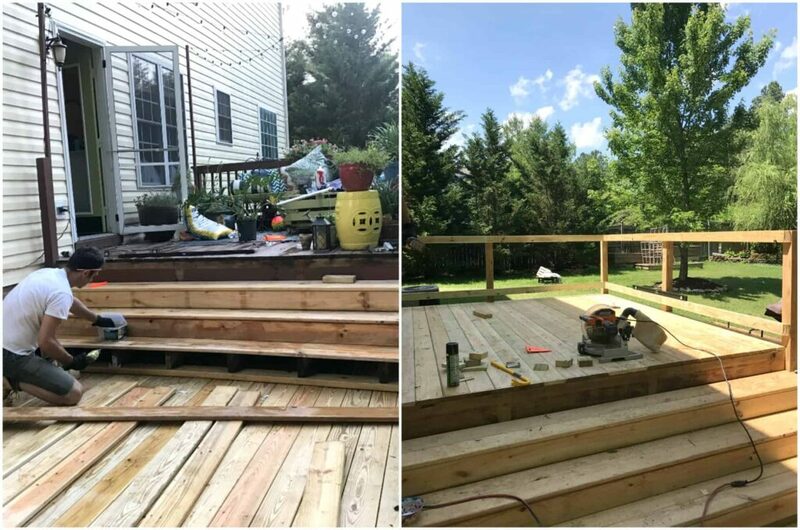 However, we could not strip off of the stain from our old deck, so my hubby had to rebuild the upper-level deck completely. Oh, the joy of unexpected obstacles!! But at the end of the day, I was happy to see the new deck. 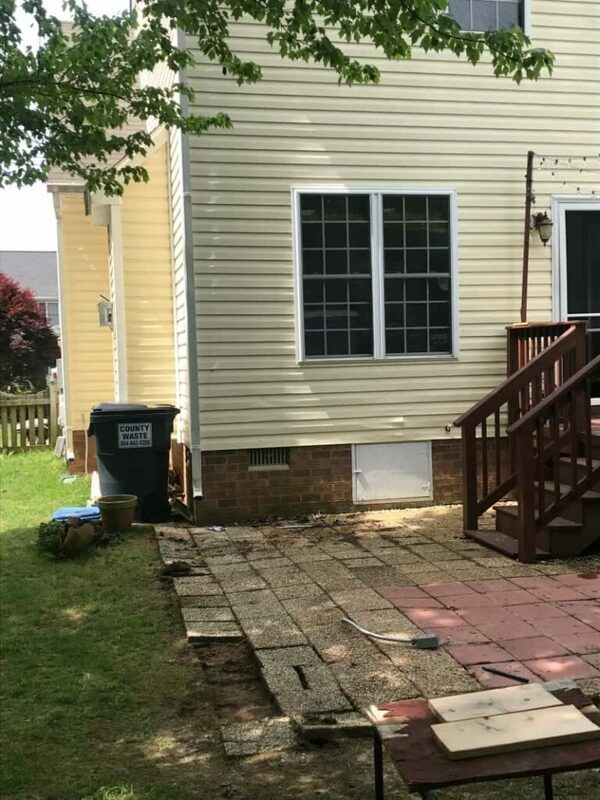 The old patio was almost 20 years old, so it was about time anyhow. My favorite section of ALL! 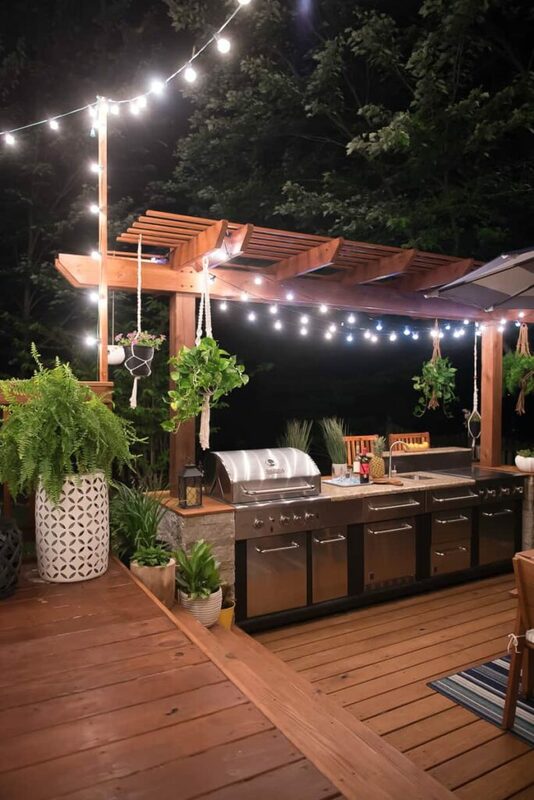 We have the large Master Forge 3 Burner Modular Grill, the Master Forge o-Burner Modular Outdoor Refrigerator and the Master Forge 3-Burner Modular Outdoor Sink and Side Burners. Perfect grill set! The manufacturer advises a 24″ clearance around the grill. However, we positioned the set differently this time. The great thing about the Master Forge Modular grill set is that you can roll each section out and change the layout any time. Building the frame for the grill needed some planning, but as soon as our grill set arrived, we outlined everything and planned out the layout right away. Then we started working on the frame and the pergola which was the biggest bite of this project. The structure is built on 2×4 poles, and the frame is covered with cement board completely. On the picture below you see the other side of the kitchen area. We planned to add a small bar section so the hub can enjoy his drink while I am cooking (or Vice Versa :-)). My original plan was to use the air stones ( the air stone is built onto the cement board) all around the frame, but we ended up using wood panels to the back of the frame, and I just LOVE how it turned out. 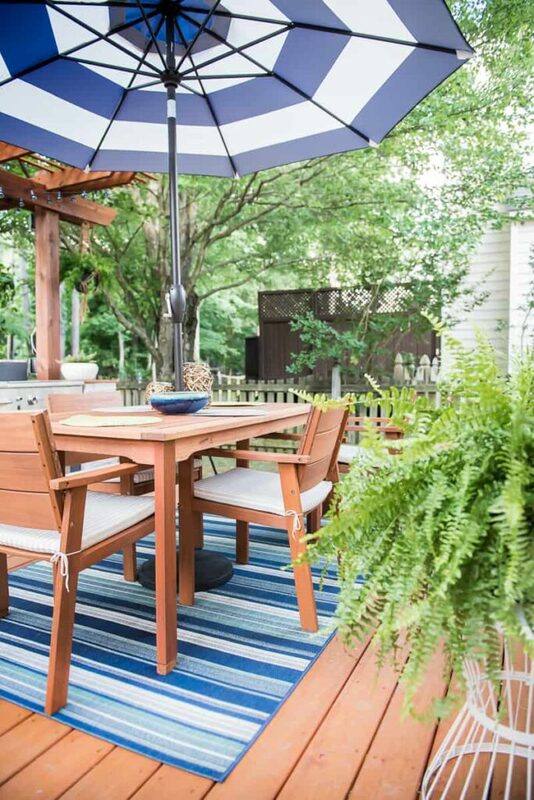 We picked out a comfy and cute outdoor dining room set. It’s not too big but perfectly enough for a family of four. It’s stylish, chic and comfortable. I fancied up the space using lots of greens and plants. 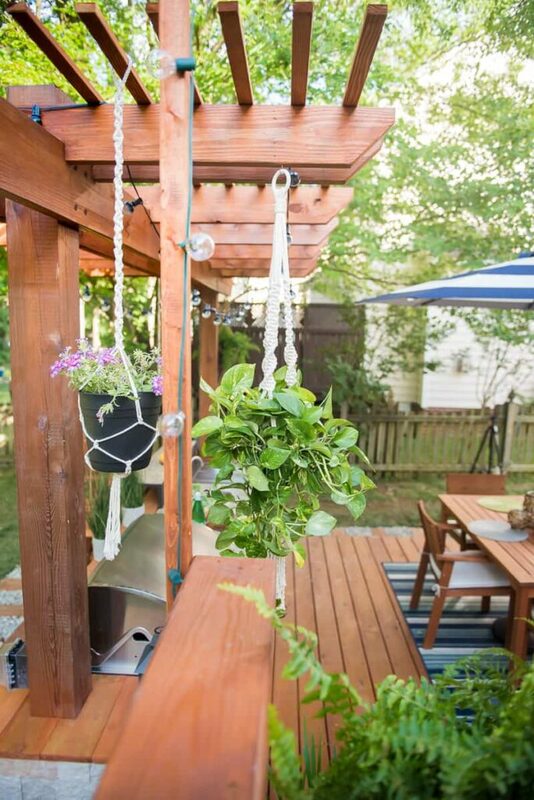 I hung greens on the pergola utilizing my macrame plant hangers that I made. 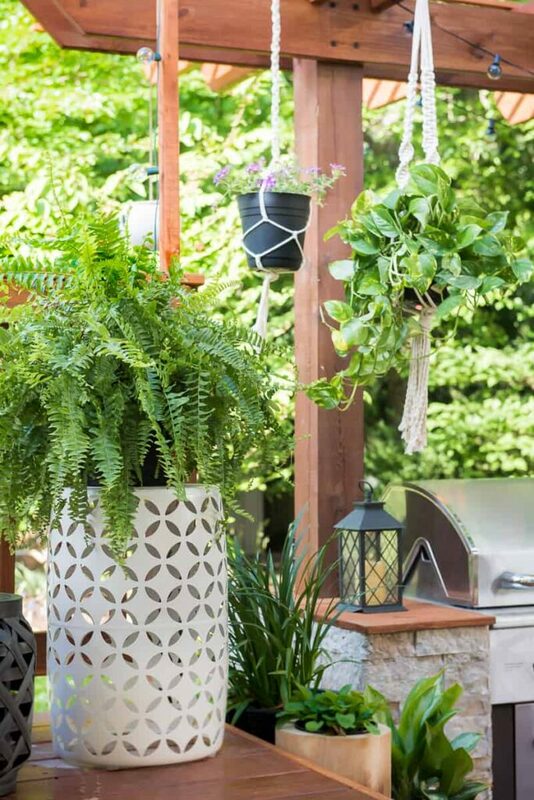 I also used some wonderful plant stands from Lowe’s to display the large plants in the space. And at the end of the day, I truly wanted to make this entire outdoor space to be one large, cohesive space, so I decided to sew a new cushion cover to my pallet furniture and I repainted the existing pallet coffee table so everything would be fresh and beautifully styled together. And here is this fantastic and cozy space lit up at night! Awe! So fun! And the obligatory BEFORE and AFTER! Now to enjoy this fabulous outdoor space for months to come! 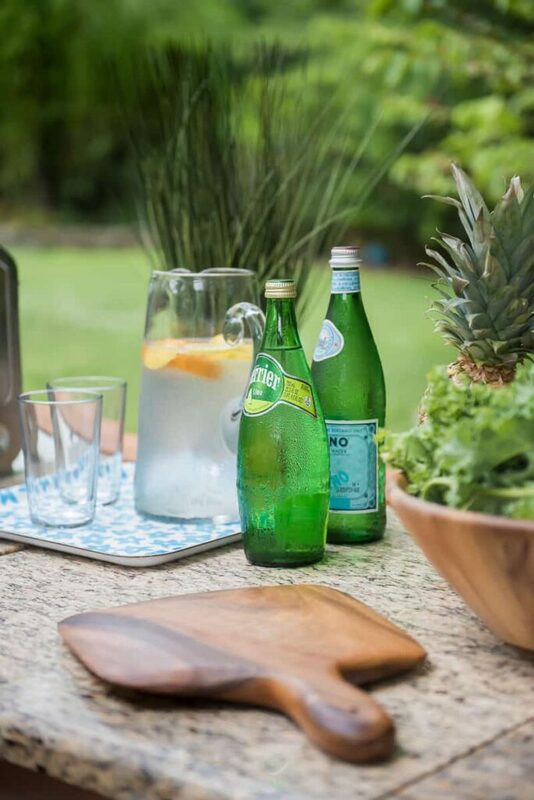 TO SHOP THIS POST, HOVER OVER THE IMAGES AND CLICK ON THE PRODUCT TAGS! We have updated the upper deck this past summer and it got a lovely makeover. 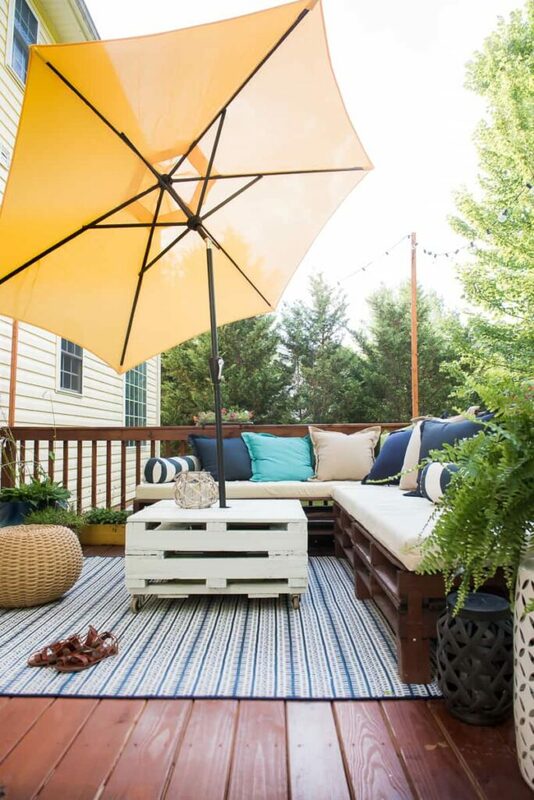 Be sure to hop over to see the PATIO UPDATE and what we added, and how we made this space even more amazing. 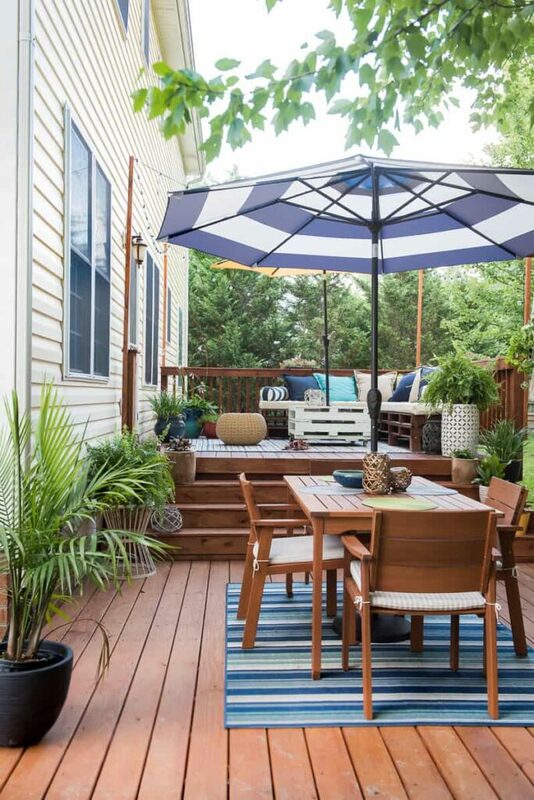 You can also check out these 10 OUTDOOR SPACES that I loved and used as an inspiration for some of my designs. Thanks for stopping by my friends! Have a wonderful summer! WOW Aniko! AMAZING. You had SUCH a vision! It turned out amazing. I LOVE it. 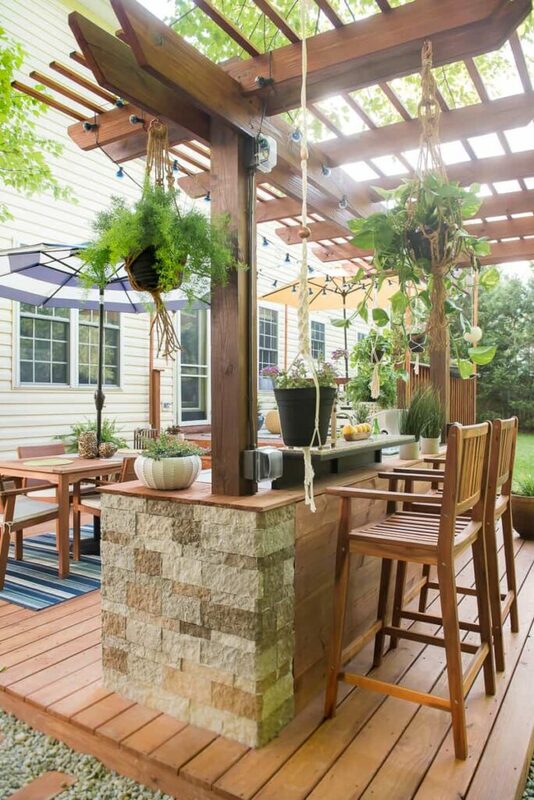 This inspires me to make our outdoor spaces into such much more. What did you use specifically for the ‘stepping stones/wood pieces’? It turned out so gorgeous, like everything you touch! I would totally live out there all summer long! I especially love the little bar on the end! absolutely AMAZING!!! I love every single thing about it! Now you can enjoy all of your hard work! yay!! Thanks, Traci! That’s the best part – to enjoy it after all the hard work we’ve put in! GIRL!!! This is so amazing!! Love it! That’s an amazing makeover! The space looks so inviting now, I’m sure your family will enjoy it! Regi, Thanks a bunch! Indeed, we are already enjoying it all day and all night! I love summer! Thank, Lady! My neighbors said that even when I am not home they will be hanging out on my deck haha! It’s beautiful! It puts my deck to shame, for sure! Aniko! You guys killed it! Love love love how it turned out! Totally would want to use the various spaces you have incorporated into this makeover. Every single area is inviting and well designed for optimum usage. Amazing job Aniko and hubs! What a great idea! Do you dig poles for the floor or you just lay it down? One question. do you bring in or store the cushions and what about the weather on the kitchen? Do you cover it when not in use? Guess that’s more than one question. Your backyard looks fantastic now! I was having trouble figuring out what to do with my backyard, but now after seeing this I have a good idea of what I want to do. 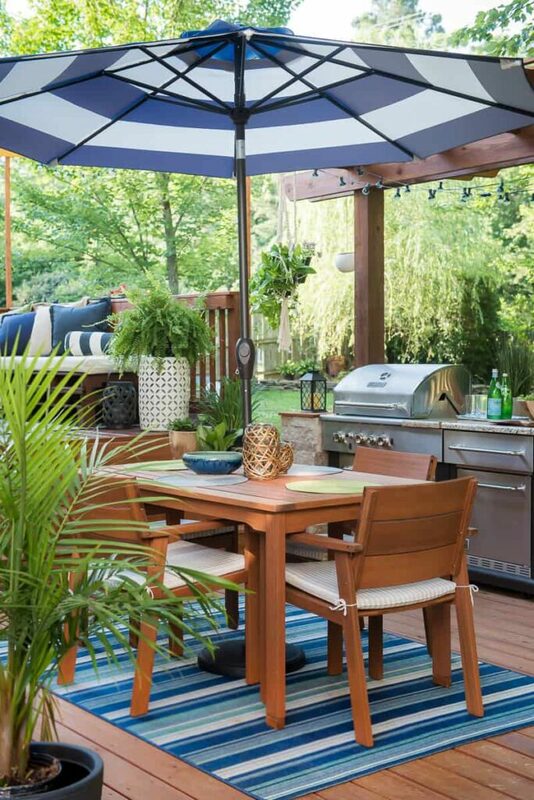 It’s pretty cool that you can pull out the BBQ and rearrange it. Thanks for sharing. I’m in LOVE! 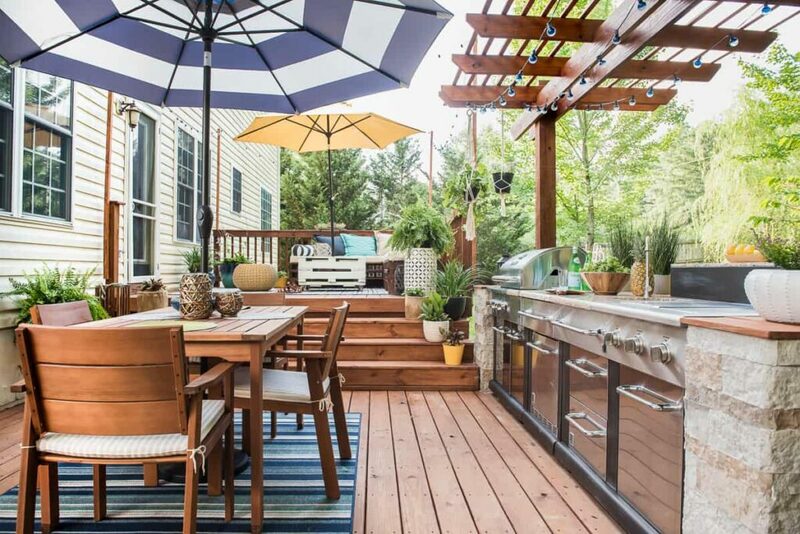 What a fantastic outdoor space you have now! May I just ask, what is the stain color/ brand you used?? It’s prefect! looks amazing. 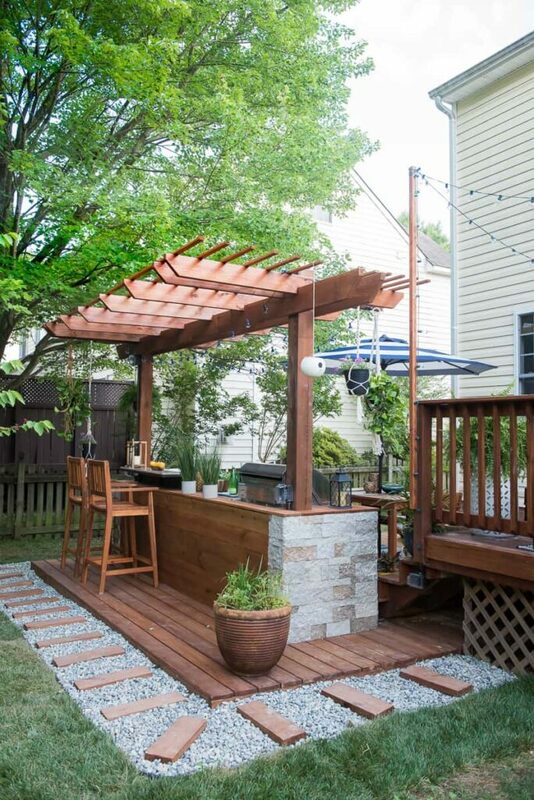 i love how open the top deck is to the bottom, and the pergola over the kitchen/bar. enjoy! Hey, Aniko. 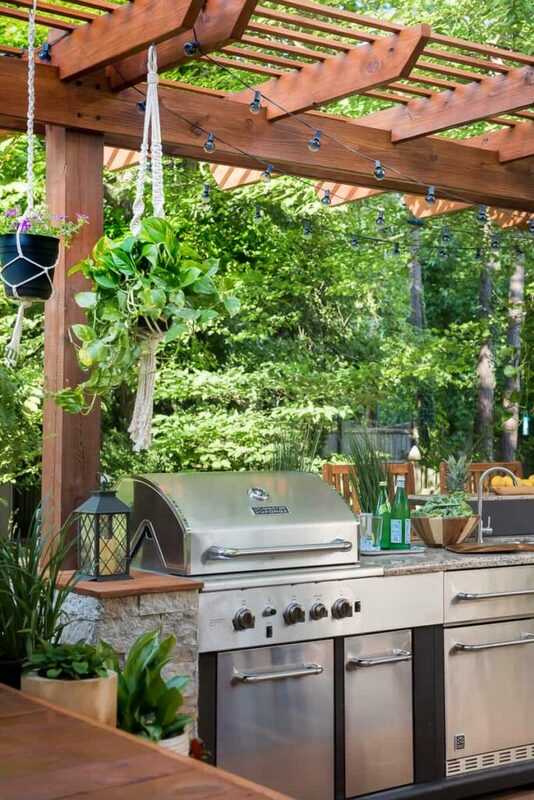 Your outdoor kitchen is fantastic! 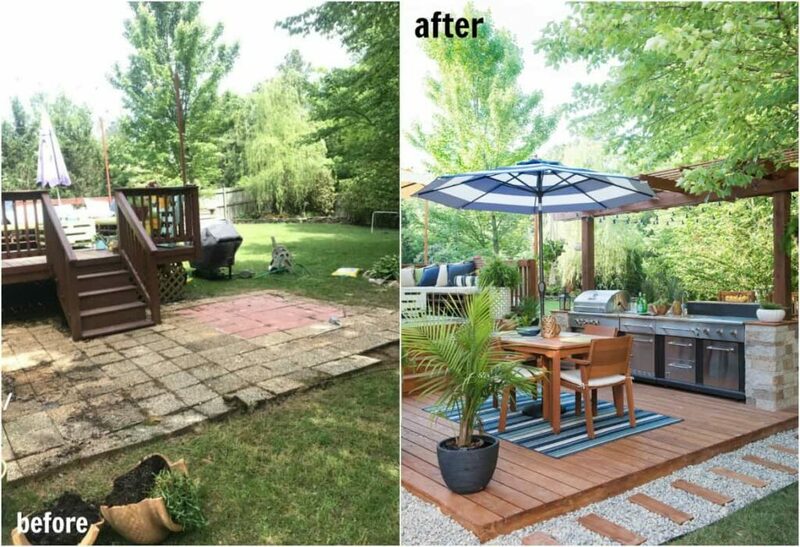 What a wonderful transformation, you surely did a great job in making use of that outdoor space. 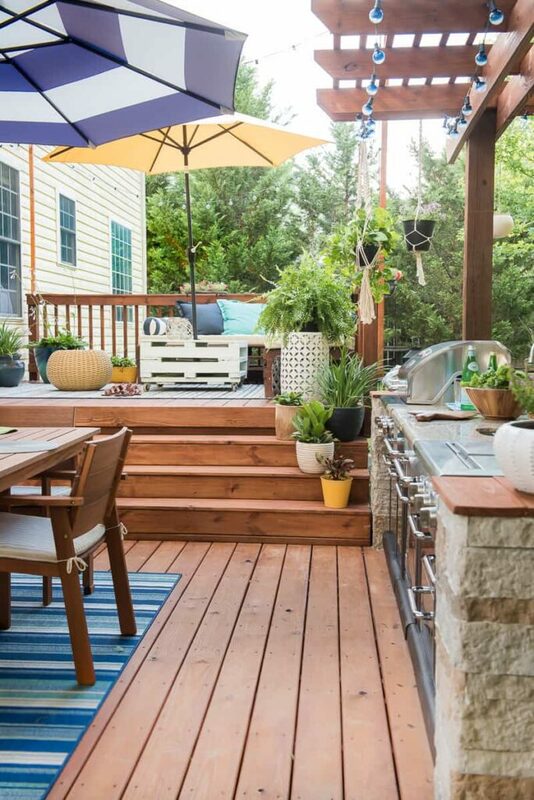 Great choice in making the stairs wide because it can serve as extra seating and the deck doesn’t feel like separated from the kitchen. You did an amazing and a very impressive job! Omg! Girl, you crushed it! 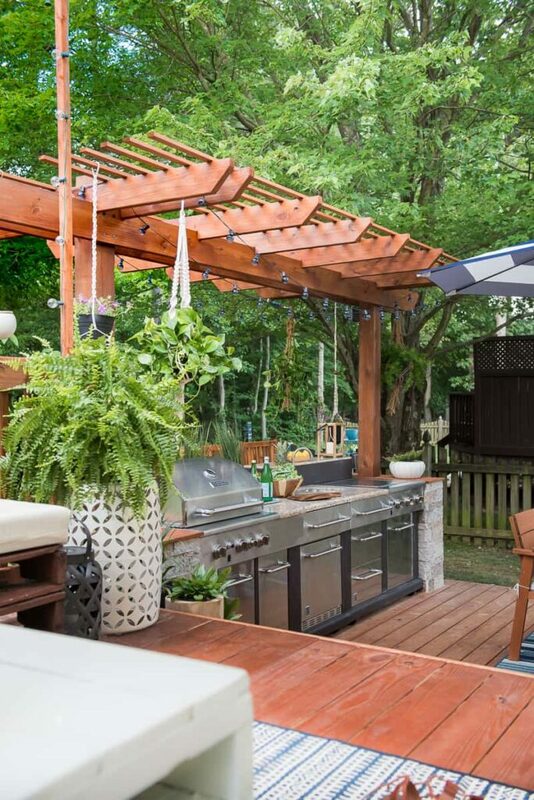 I’m super jealous of this outdoor kitchen. What a phenomenal transformation. Amazing job!!! YAY for sure! 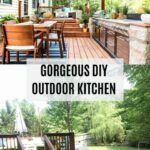 My husband and I are looking into building our outdoor kitchen. 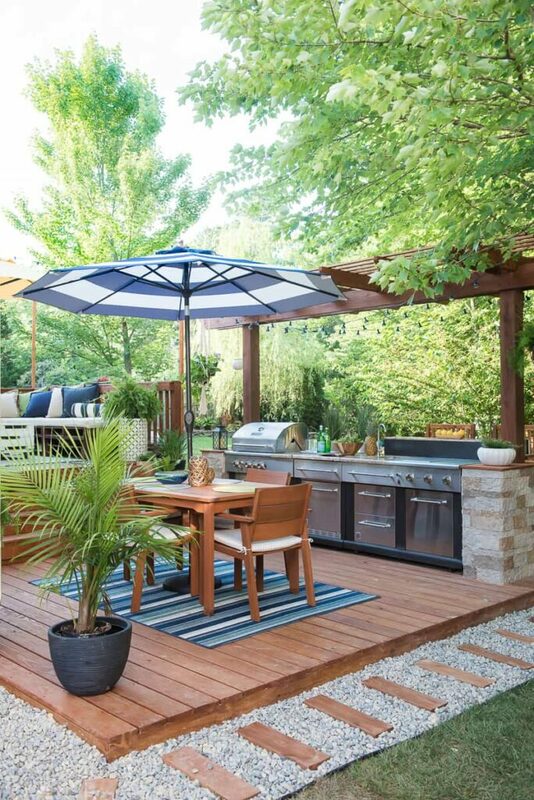 We love yours <3 My question is how big is the deck area you built for your outdoor kitchen? We're trying to figure out how big to make ours. Thanks !! Again, thanks for sharing, love it !!! So, so, so good!!!!! You crushed it! Looking forward to the tutorial on the lower deck! Thank you for the inspiration! Wow! 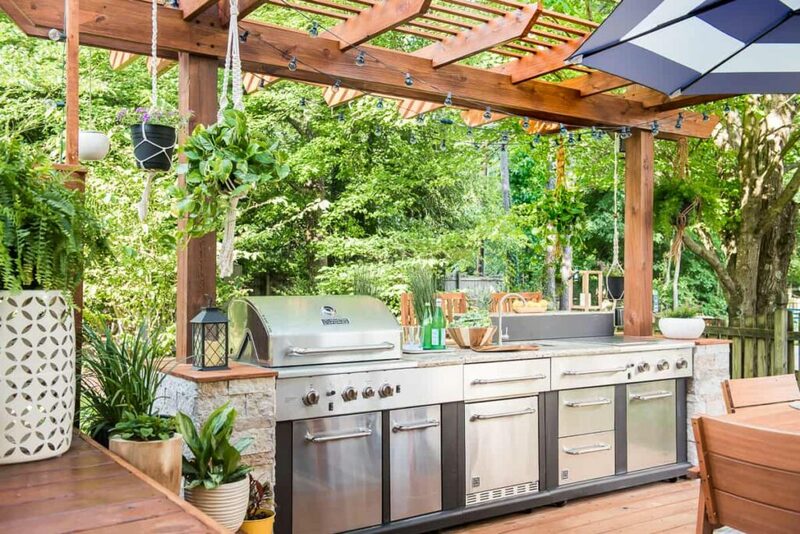 I’ve never seen an outdoor kitchen at someone’s house – it’s always been at posh hotels or restaurants, it looks stunning! Have you got much use out of it so far? We used it a LOT over the summer. I mean it was the neighborhood’s “hot spot” for entertaining haha! Loved it! Never regret having it for sure! Hey there, you guys did a fantastic job! 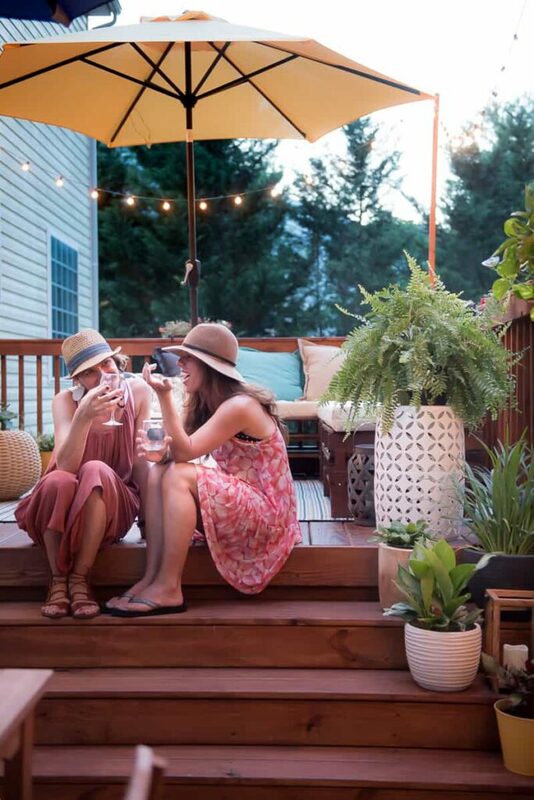 We are about to build our deck and outdoor space and yours is exactly what we’ll be doing. 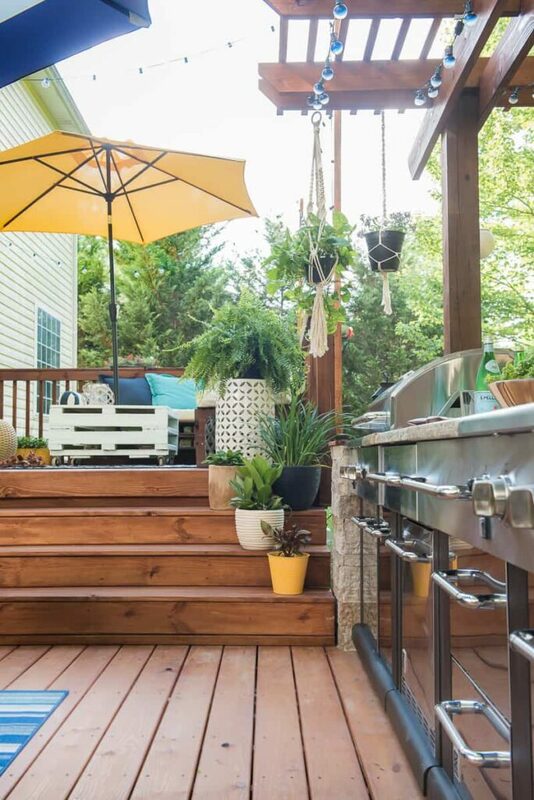 I have a question though, how big is the lower deck with the bbq? It looks stunning. 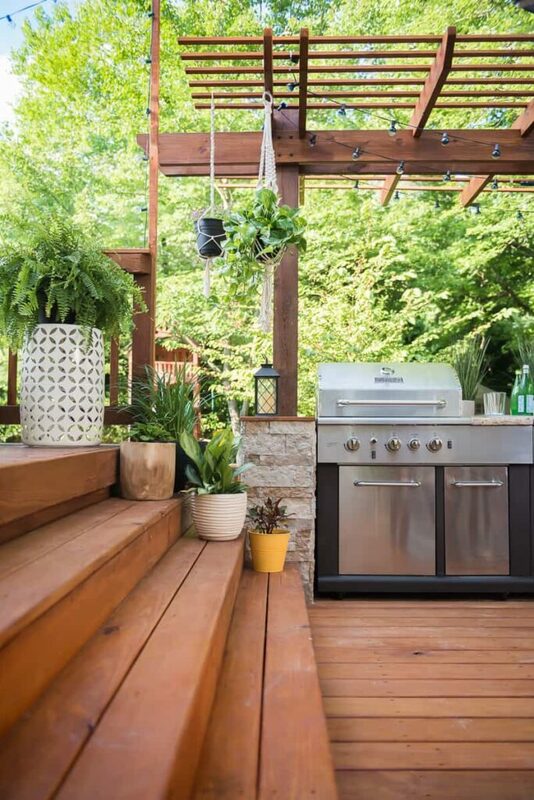 I’ve never seen an outdoor kitchen at someone’s house. What a phenomenal transformation. Amazing job. Looking forward to the tutorial on the lower deck! Thank you for the inspiration.